The Yamaha line of Intermediate flutes has been updated to surpass the evolving needs of student flutists. Featuring an industry-leading pointed key arm design and a complete review and update to many aspects of the production process, the 300 series intermediate flutes emphasize the Yamaha consistency and quality that keeps these flutes strong and singing for young flutists. The YFL-362H features a sterling silver headjoint and nickel silver body with open-hole keys, an offset-G key, and B-footjoint with Gizmo key. STERLING SILVER HEADJOINT: A sterling silver headjoint provides a beautiful sound with warm, colorful resonance. POINTED KEY ARMS: A#, F# and other non-fingered keys feature pointed key arms, similar to those found on top-of-the-line Yamaha Handmade Flutes. 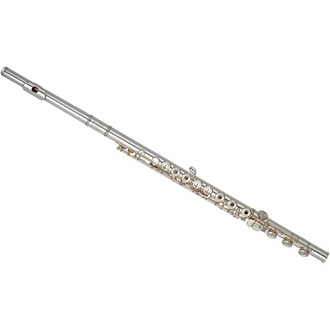 This high end feature brings strength and beauty to these intermediate level flutes. OPEN-HOLE KEYS: Open-hole keys give the player more control over the tone of the flute. OFFSET-G KEY: The offset-G key configuration offers a natural feeling hand position.